The wreckage of the car following the crash. A suspected drink driver had a miraculous escape after crashing his car into a roadside barrier which passed through his car’s windscreen and out through the side window. Dramatic pictures show the front of the vehicle, believed to be a Land Rover Discovery, crushed in the impact, with the metal barrier wedged inside the vehicle. Police have released the photo of the aftermath nationally as a warning to anyone contemplating drink driving! 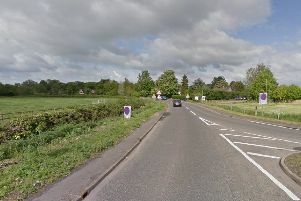 The male motorist walked away from the wreckage without a scratch after careering into the metal barrier at the side of the A4146 near Linslade, Bedfordshire. He was breathalysed and provided a positive breath sample following the crash, which happened shortly after 3.24pm on Friday. A man was charged with drink driving following the incident.